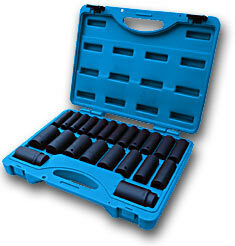 Download Download Sets Catalogue Suitable for all pneumatic, hydraulic, electric torque wrenches and air nut runners. Easy to see what's missing! RIGHT SOCKET - RIGHT JOB - Outstanding performance and longevity. 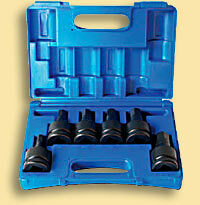 Impact socket sets feature recessed corner technology to ensure nut load is flank-loaded rather in the corners. Better socket fit, simply improves the stability of High Torques at high loads. 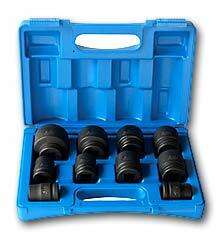 Torque or high Torque impact socket sets are now available designed specifically for powered torque wrenches. Material: Chrome molybdenum Alloy Steel. Federal Specifications: GGG-W-660A and DIN 3121 & 3129. 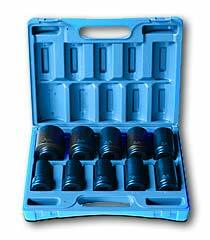 Specializing to larger size Impact Socket set for industry from 1/2" up to 8" a/f. Sizes Standard: 1", 1-1/16", 1-1/8", 1-3/16", 1-1/4", 1-5/16", 1-3/8", 1-7/16", 1-1/2", 1-5/8"
PDF Brochure Sizes Standard: 3/4", 13/16", 7/8", 15/16", 1", 1-1/16", 1-1/8", 1-3/16", 1-1/4", 1-5/16"1-3/8", 1-7/16", 1-1/2", 1-9/16", 1-5/8", 1-11/16", 1-3/4", 1-13/16", 1-7/8", 1-15/16, 2", 2-1/16", 2-1/8", 2-3/16", 2-1/4", 2-5/16", 2-3/8", 2-7/16", 2-1/2"
PDF Brochure Sizes Deep:1", 1-1/16", 1-1/8", 1-3/16", 1-1/4", 1-5/16", 1-3/8", 1-7/16", 1-1/2", 1-5/8"
PDF Brochure Sizes Deep: 3/4", 13/16", 7/8", 15/16", 1", 1-1/16", 1-1/8", 1-3/16", 1-1/4", 1-5/16"1-3/8", 1-7/16", 1-1/2", 1-9/16", 1-5/8", 1-11/16", 1-3/4", 1-13/16", 1-7/8", 1-15/16, 2", 2-1/16", 2-1/8", 2-3/16", 2-1/4", 2-5/16", 2-3/8", 2-7/16", 2-1/2"
3/4”, 1”, 1-1/2” and 2-1/2” Sq Dr Impact sockets play an important role in running maintenance smoothly. When an Impact Socket is holding up maintenance avoid compromise - use only High-Torque Impact Sockets for all torque tooling applications. The Deep Impact Socket offers addition length to pass over long thread. From 3/4" up to 6" AF ( across flats ). High Torque Sockets for Impact Guns, Torque Multipliers, air Nut Runners and Hydraulic Torque Wrenches are delivered Aust Wide. Hire high quality imperial and metric impact sockets. 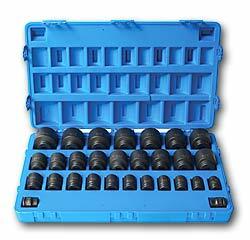 These sockets are designed specifically for pneumatic, hydraulic, electrical torque wrenches and air nut runners. Impact Sockets have an optimum wall thickness for strength, reliabilty and durability. Sockets are made from high strength alloy steel, heat treated for a combination of strength & impact resistance. Sockets are plated & black oxidize coated. All Rent Tools can be delivered Australia Wide. 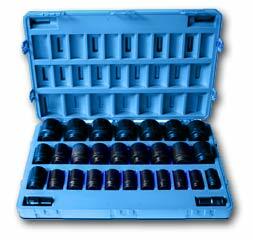 Hire Torque Tools Aust have workshops in South Australia, NSW, Queensland and soon Tasmania.